Need to Powerflush My Heating System? Have your radiators been bled? Air can often accumulate in radiators, limiting the flow of water and, therefore, heat. You can buy radiator keys at most homeware stores. Simply allow the air to escape, catching any drips of water and test the central heating again. If you find you have to bleed radiators on a regular basis, a powerflush might be needed. Likewise, if there are still cold spots in radiators after you’ve allowed the air out, then you could need the entire system cleaning. What colour is the water coming out of radiators? Whilst you shouldn’t expect anything too pristine to be coming out of your central heating system, the water should be fairly clean. When you’re bleeding the radiators of air, it’s worthwhile taking a moment to look at the water. If it’s murky, has bits of debris in it or is sludgy, it’s almost certain you’ve got a build-up of detritus in the system and will need it to be powerflushed. How noisy is your boiler? Another indication you might need to power flush central heating is a noisy boiler. By their nature, boilers might emit a low hum and will click on start-up. 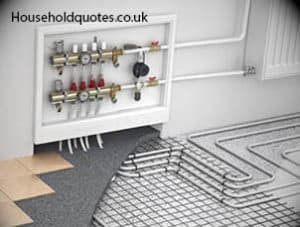 However, a constant rumbling, clicking or knocking suggest something is seriously wrong, either with the boiler itself, the system as a whole, or both. You should definitely consider having your boiler serviced for safety. If the all clear is given, it might be that a build-up of sludge and clogged pipes is putting immense pressure on the boiler. Powerflushing the system can help alleviate this. How long has the system been installed? Depending on the boiler, central heating systems are quite good at looking after themselves. However, there comes a point in time when everything needs a little care and attention. If your central heating hasn’t been flushed for a long time, 10 years for example, it’s worth having it powerflushed – you might be surprised at just how much better your heating becomes! Are you getting a new boiler? A build up of sludge and debris can cause major problems to a central heating system. So you don’t want to go and spend thousands of pounds on a new boiler only to have it damaged by a system that’s not working properly. If you’re having a new boiler installed, then you should definitely have your radiators flushed. Though you don’t need to powerflush your system every year, it’s worthwhile paying to have it done every few years. Cleaning your central heating has a number of benefits, and can prolong the life of your boiler. After being flushed of debris, pipes and radiators will become hotter more quickly and you’ll benefit from increased heat distribution across the house. The system will also be more efficient, helping to save you money on your energy bill. Having your central heating flushed through might not quite as expensive as you think, and though it’s a few hundred pounds, you should get a better, more efficient and cheaper-to-run system in the long run. For a two-bed house with a boiler under 20 years old, you should expect quotes to be in the region of between £300 and £500. In London and the surrounding areas, prices can be a little higher, so £550 is not an unreasonable sum. If you used a site like Quotatis you’ll be able to gather a variety of quotes to give you a better idea of the exact cost. During the service, be prepared for a certain amount of disruption. You won’t be able to have the central heating on, so it’s a good idea to powerflush your radiators during warm weather. It can also be a dirty job, with tradesmen needing to remove each radiator and flush out the grime. Most professionals will be as clean as possible, but it’s almost certain there will be some cleaning up to do. In addition, even in a small two-bed house, it can take between four and six hours to complete. The benefits of powerflushing your entire central heating system can be extremely worthwhile. And there’s nothing quite like knowing you’ve got a safe, efficient system you can rely on as the nights draw in and the temperatures begin to drop.